This form of isomerism is rare and is limited to molecules having a divalent atom like O or S and alkyl groups around it. The main examples come from ethers and thioethers. 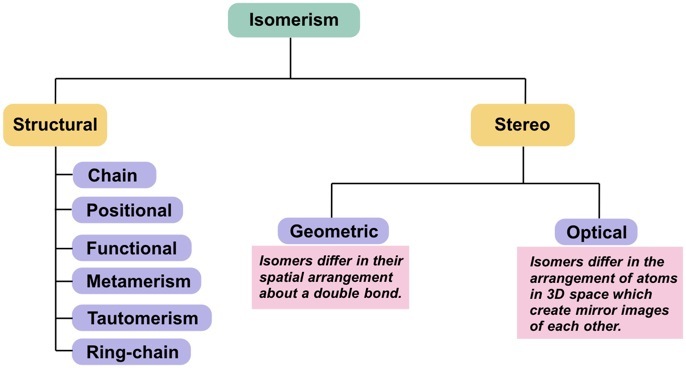 This isomerism is due to spontaneous intreconversion of two isomeric forms with different functional groups. The prerequisites for this is the presence of the C=O, C==N or N=O in the usual cases and an alpha H atom. The most usual is the ‘keto-enol’ tautomerism, but there can be others like nitro-aci and amine-imine forms. In general the Keto form is more stable. Enols can be forms by acid or base catalysis from the ketone and are extensively used in making C-C single bonds in organic synthesis. Here one isomer is an open chain molecule and the other a cyclic molecule. Propene is an alkene and cyclopropane an alkane, two different classes of compounds.